MWC: UPDATE: Samsung Galaxy Beam smartphone projector; more details | What Hi-Fi? We've just had the chance to get hands-on with the Samsung Galaxy Beam and unearth a few more details. While the smartphone, predominantly the software, isn't the finished article, the projector was up and running and worked well enough in a dark room. We're guessing the 15 lumens won't be too clever in a bright room - not unlike dedicated 'pico' projectors. We were told the battery life would be around 3 hours with the projector running, so good enough for watching a film (the odd director's cut not withstanding). The Galaxy Beam phone itself is a little chunkier than the average super-slim smartphone we're used to but not worryingly so and similarly only feels a touch heavier, at 300g, than the latest-gen mobiles. The lens can be fired in certain angles allowing you, as was used as an example by Samsung, to project on to a ceiling as you lie in bed. Anything on the Galaxy Beam's screen can be projected, meaning you could for example use the camera while being able to view the images on a wall. It can also be programmed to fire up the projector when the alarm goes off. There will also be a speaker dock, allowing you to dock the phone while adding sound to the projector experience. We'd imagine it will charge the Galaxy Beam, too. Matthew Brum, product management at Samsung, said: "It's about driving the market forward with new hardware. It can be used in multiple ways, in consumer and business environments." And could a projector become a standard feature on smartphones, just like a camera? "It shouldn't impact on size and battery, it's not compromising, so why not just add it?" Brum said, while admitting Samsung would of course being looking at the response to the Galaxy Beam before launching any more projector smartphones. On the subject of which, it looks increasingly likely a smartphone, probably the Galaxy S III, will be launched around the Olympics. Seen as a key driver of all things entertainment-based, Samsung wouldn't be drawn on the matter but from our conversations a product release around the event looks increasingly likely. Read more about the Samsung Galaxy Beam in our original news story below. Samsung has launched the Galaxy Beam, a compact smartphone with an integrated projector. Capable of projecting a 50in image on any nearby wall, the 'smartphone projector' remains just 12.5mm thick and has a 4in screen. Running the Android 2.3 (Gingerbread) OS, it has an 8GB internal memory, SD card slot and 1GHz dual-core processor. But it's the 480 x 360, 15 lumens brightness projector that is most intruguing, capable of beaming images taken on the 5 MP camera to any nearby wall. As well as your own pictures and 720p video, it can project content from the likes of YouTube and games from Samsung's own 1000-strong Game Hub. 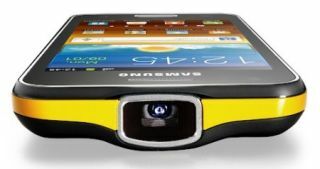 The Samsung Galaxy Beam smartphone projector is due out in Q2 of 2012.